How Did Microscopes Get Invented? More than 400 years ago in Holland, Zacharias Jansenn was in the business of grinding lenses for eyeglasses. Some of his lenses made things look bigger. He found that he could put two lenses together to make things look a LOT bigger. The first microscopes made things look 20 or 30 times larger than they are. This is enough to see the details of some tiny plants and insects and animals that are too small to see with just our eyes. Here's a drawing of what Zacharias Jansenn might have seen when he used his microscope to look at water! But that's not enough to get a good look at really small things. 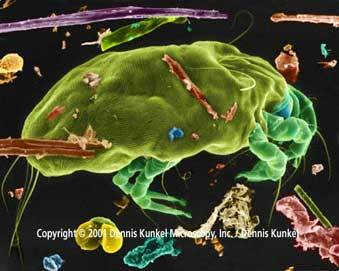 For example, the dust mite you see here is hundreds of times larger than a real dust mite! Want to know who made this photo, click here! In the 1600's, another man who lived in Holland, Anton van Leeuwenhoek (say, "lay-you-wen-hook") began to make microscopes a as a hobby. He was in the business of selling cloth, but he became very good at making microscopes. His microscopes could magnify an object up to 200 times. He collected things to look at -- water and plants and blood and dirt. When he scraped stuff off of his own teeth, Anton van Leeuwenhoek became the first person to see bacteria! People kept finding new ways to get bigger and clearer images from microscopes. Today, a microscope that bends light with lenses can magnify up to 1,500 times! But there are microscopes that can do even better than that! A microscope that bounces a beam of electrons (electrons are parts of atoms) off an object can magnify up to 300,000 times! What we can see with an electron microscope is also clearer than what we can see with a compound microscope. And there are other kinds of microscopes that can magnify things millions of times! Click here to see atoms magnified 45 millions times! Want to meet someone who made most of the microscopic photographs you see on this site? Visit Dennis Kunkel!